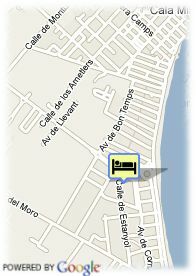 Plaza Estanyol s/n, 07560 Cala Millor, Spanje. An Aparthotel located in a tranquil area only a few metres from the beach and the Cala Millor promenade. Forming three buildings with a total of 139 Apartments and 69 Studios. All fitted with a full kitchen and bathroom and equipped with air-conditioning, Sat TV, telephone and a safe (for rent). Posessing amplious gardens and terraces, with a large outdoor swimming-pool and solarium, indoor swimming-pool conditioned for winter use and a sauna, an entertainment for adults and children during the day and evening. An ideal complex for couples and families.